We at DontCrack are proud to introduce the new Magnetics Bundle 2, designed to give you the warmth and richness of classic vintage effects. 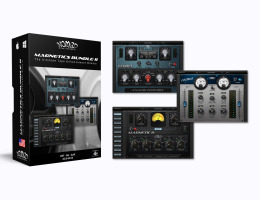 The Magnetics Bundle 2 contains Magnetic, a Reel-to-Reel Audio Tape Warming effect, Echoes, a faithfull modelisation of the greatest delay effects of all time and the brand new product, COSMOS, which uses harmonic enhancement instead of traditional EQ boosting to bring out desirable frequencies in your audio material. Now put COSMOS together with Magnetic and Echoes and you have this greatest analog toolset ever. These three plug-ins give you the means to have the "ultimate analog" sound for your mixes. MAGNETIC II, is a Reel-to-Reel Audio Tape Warming effect that gives your tracks the elusive vintage tape sound which your ears crave. This effect can inject sterile audio with the warmth and character of classic tube circuitry and analog tape saturation. ECHOES is a new Analog Echo Box plug-in designed to give you the warmth and richness of classic vintage delay effects. ECHOES faithfully models the greatest delay effects of all time, PLX-1 based on* Echoplex 1, PLX-3 based on* Echoplex 3, OILCAN based on Tel-Ray Oilcan Delay, EHX-DM based on* Electro Harmonix Deluxe Memory Man, and ADM-2 based on* Boss DM-2 Analog Delay. These three effects in the "Magnetics Bundle 2" should cost you a total of $407, but we are making them available for ONLY $299 ! Apple Compatibility : AudioUnit, AAX and RTAS (Pro Tools), and VST plug-ins. Windows Compatibility : VST, AAX and RTAS (Pro Tools) plug-ins.